The built-in LED flash of smart phone is supposed to improve your capture in low light, but the result is usually disappointing, especially in dark environment. so an add-on constant light source will become handy for this scenerio , and thats why we have developed the Digitechi LED Spotlight. The Digitechi LED Spotlight is a practical, portable light source that measures 2.5 x 1.5 inches. 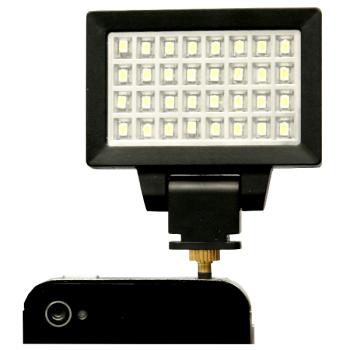 As we can see from the images, the pocket spotlight features ultra portable design, and comes with a built-in array of 32 LED lights, and using removable 3.5 mm audio connector you can easily plug the spotlight on your smart phone or tablet in order to offer you a constant light source for low light event photography. Moreover, removing the audio connector, you can also attach it onto the hot-shoe of your camera. Apart from that, the portable spotlight is powered by built-in rechargeable battery that can offer up to an hour of brightly shining at full USB charge.